We have all been entranced by the clunking steel ducks waddling along their track at the show. Occasionally we even go a step further and pay the attendant the tax to try our hand at taking a few of them out. For the small fee you receive a tin top of pellets. You load the rifle and imagine yourself in a John Wayne western as you spot the little yellow duck’s peppered complexion through the sights of the raggedy air rifle. There is something so compelling about sighting the target perhaps it’s the anticipation of a hopeful hit or perhaps it’s something more primal; transcending time back to our hunter roots. Your ears tune out as your mind tunes in and despite all the noise of the side shows; Silence. Suddenly you strike. The sound of a metallic C sharp rings through the air, the chorus of carnival games returns and you feel an overwhelming sense of satisfaction that has you wanting to relive that small moment of joy over and over again. Imagine all of these sensations amplified by a hundred, that’s target shooting. I have been shooting target rifle for about twelve months. When I began my experience of firearms was little more than what was described in the opening paragraph. 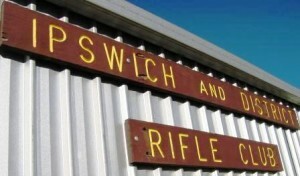 I was introduced to the Ipswich and District Rifle Club (who cater for full bore .308 and .223 calibre long range target shooting over ranges from 300 to 800 metres) by a friend who invited me to come and try target shooting. I came along to the Saturday club shoot and met up with him. A bit nervous and shy, I was surprised to find the club captain was an old friend from another time in my life. This helped ease my nerves somewhat. The other members of the club were great too. A welcoming hello and warm smile goes a long way to making new shooters feel welcome. My first shoot was a trial to see which I enjoyed more; One round of F class (scoped rifle supported on a rest) and one round of TR (a rifle fitted with peep sights supported by the shooter and a leather strap or sling). It became immediately obvious there was a friendly rivalry between the ‘scopies’ and the Target riflemen, both were pushing their case to recruit me into their ranks. At the conclusion of the day the decision for me was easy. I loved the challenge of the peep sights and was in awe of their accuracy even with my inexperience. The friendly club atmosphere, the sound of the .308 beating its way up the valley, the surprise of the scores as the target peers over the butts, the smell of burnt powder and even marking the targets, I was sold. The next few months I used the club equipment and rifle which were always well maintained. With this and a bipod (training wheels for target rifleman) I began to develop my skills at sighting the target properly and controlling my breathing to release a quality shot. This was a slow and arduous process but I was fortunate to have coaching from club members who had a vast experience in competitive target Rifle. Eventually I began to show signs of improvement. The time for me to lose the training wheels and graduate to a sling was nearing. But first I needed to acquire my Queensland firearms license and my own rifle. The firearms license took the longest. The process took about 3 months which was better than some others from stories I have heard. Then I needed to find a suitable rifle. Eventually one came up that was within my price range. It was a Whitworth MKX with a stainless steel barrel. Based on a Mauser action it has proven to be very reliable. Eventually I became established acquiring all the necessary equipment I would need. Each week I go out to the rifle range ready to battle the breeze and shoot the best I can. Twelve months have passed and I still love getting out there on a Saturday afternoon. I even get a little disappointed when I can’t make it. My shooting has shown steady improvement and there has never been a shortage of advice on how to improve. Sometimes what piece of advice to focus on next can be a problem (this is not really a bad problem to have). My shooting has steadily improved and my average score (which is nothing to write about) this year has improved by about 10 points. I find this steady improvement very satisfying. I keep a record of my scores at each range and when I come off the mound feeling a little frustrated reviewing them helps me to put my small successes into perspective. These small successes and a little encouragement from club members have seen me attend the last couple of club fixtures. In the handicap competition I feel like a valued team member. These meets have been a profound experience and helped me (a relative novice) to build confidence in Target Rifle. My next goal is to compete in an open prize meet and maybe even one day a Queen’s prize meet. If you’ve always loved shooting or never had a chance to try it our club, Ipswich and District Rifle Club is a great place to start. Our members provide a friendly and social atmosphere and always welcome interested people to try the sport no matter what their level of experience is. We supply quality equipment for newcomers to use at no cost. We have club members always available to coach new shooters who have had a vast experience at club, state and international levels of competition. This along with strict safety rules ensures a safe and enjoyable experience. Ammunition is available for purchase on the range and a standard weekly range fee is also required but these and a cold can of soft drink is easily catered for out of $50. The only other thing you will need is a ‘have a go’ attitude and a propensity for fun. 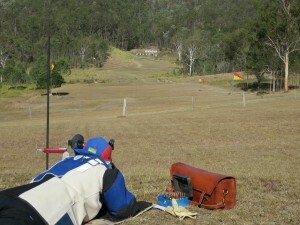 Ipswich and District Rifle Club meets most Saturdays at ‘Stewartdale’ Ripley from 1pm. If the big bang of a .308 is not for you we also offer the occasional .22 rimfire shoot (see our club calendar for these dates) which would be a natural progression from the small pop of sideshow air rifles. 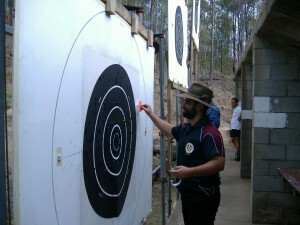 For more information about Target shooting contact the club at idrc@live.com.au. So why not visit Ipswich and District Rifle Club at Ripley and come try target shooting.